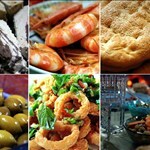 Our partner Alex is a private chef in Corfu. Based on the solid foundations of the Greek cuisine, his cooking style is utterly fearless, and he recognizes no boundaries to his sources of inspiration. Children of 12 years old or younger are served with 15% discount and the food quantities are adjusted accordingly. The unforgettable experience of being personally served by a private chef in the Greek islands is no longer limited to the elite few. 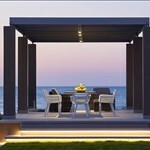 It is now a popular trend among groups and families who wish to experience that high-class restaurant feel in the comfort and privacy of their own holiday apartment, villa or yacht. We are very excited about our partnership with private chef Alex, who prepares and serves meals for those guests who have an interest in enjoying famous Greek cuisine and gastronomy. Alex is a native of the island of Corfu, where he was born and raised. His half-Mexican and half-Greek descent offers him a unique culinary vantage point from which to magically blend Latin and Mediterranean cuisines. Alex graduated with the honours from Greece's prestigious Culinary Institute. His lifelong adventure with taste and flavor began in the renowned kitchen of the Luxury Hotel Imperial 5* Exclusive Resort. He was mentored in numerous famous Greek and European restaurants, such as Vezene Athens, Milos Athens and Las Iguanas England. He then went on to run his own kitchen as the head chef of the luxurious Mediterranean Ristorante Bianco a Nero in Prague. His experience as a private chef for European billionaires is now 5 years long, and it continues to grow. His culinary philosophy is based on a solid foundation of Mediterranean cooking, due to its widely-acknowledged health advantages, and he only works with the highest quality and freshest ingredients that are available. Over the last 4 years he has expanded his culinary horizons by specializing in molecular cuisine, which brings a unique flair to his combination of cutting edge techniques and authentic inspiration. Alex's style of cooking is based on boundless innovation and inspiration. Whether he is preparing a 9-course fine dining experience or his simple yet delicious "home style" cooking, everything is guaranteed to far exceed your expectations. He is an accomplished chef across a broad range of cuisines, including Greek, Mediterranean, BBQ, Mexican, Asian and French. Alargo's Private Chef Service in Greece is as flexible as it is delicious, and you are able to select as many courses as you prefer for your experience of Greek villas with a private chef. You can reserve a sumptuous single dinner from among our carefully crafted set menus or let the chef prepare your favourite meals for a portion or the entirety of your yachting or villa Corfu holiday. Private Chef Alex makes it simple to host amazing and memorable events in your yacht, holiday home or party venue. 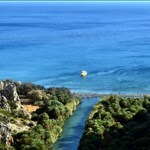 The chef's private service is offered as far as 40km from the town of Corfu. Alex will travel directly to you at any location on the island for an additional fee. From the beginning to the end, Alex will ensure that every single one of your needs and expectations are exceeded. He supplies all the freshest ingredients, prepares and cooks your dishes, serves the food and then even cleans up after. Your only responsibility is to relax with a glass or two of wine, and savour the unparalleled gastronomic experience that is awaiting you. Alex adheres to strict food and sanitation guidelines, and also considers any dietary restrictions, all while ensuring that only local fresh ingredients are used. His meals are prepared at your villa or other selected venue, and the only thing he will leave you with is fond memories of outstanding food and charming company, and not a dirty dish in sight. For a taste of what is on offer, please examine our current delicious preset menus. We will also arrange for special events, from cookery classes to canape receptions, and any other culinary experience that you can imagine. You can book Alex as your very own private chef for some or all of your Corfu holiday, and allow us to elevate your meal times from a chore to a sumptuous occasion for enjoying, savouring and remembering. Private Chef (one-time experience, part time or full time). Pre-set menus of 4 courses and service for a maximum of 25 guests. 5 to 9 course preset menus and service for a maximum of 8 guests. Menu planning and consultations, on-site food preparation and complete kitchen clean-up. Wine tasting of up to 5 wines, matched with a complementary set menu or cheese, cold or deli assortment platter. Wine pairings for selected menus. All seafood is fresh, and subject to availability. If necessary, it can be appropriately replaced. Special event hosting, such as cocktail and birthday parties, galas and so on. Sous vide cooking and molecular gastronomy techniques. Private chef lessons, from fine dining to simple foods. Menus are open to adjustment after consultation for accommodating allergies, preferences and dietary restrictions. The Mediterranean cooking style is currently one of the hottest trends from around the world as a result of its contributions to healthy living. Alex has grown up alongside the bounty of Greece's natural produce, and the traditions that his family have passed down to him have created his signature blend of Mediterranean and Ionian cuisine with the latest in cutting edge culinary techniques. The end result is food that is intoxicatingly unique in terms of both tastes and aromas, leading to an incomparable dining experience every single time that he cooks.